A new partnership between the University of Toronto and city of Barrie will provide a vehicle for innovative, collaborative efforts to improve community health. The partnership is called the Healthy Barrie project and includes the Dalla Lana School of Public Health, the Faculty of Medicine, the City of Barrie, the Barrie Community Family Health Team and Family Health Organization, and the Simcoe Muskoka District Health Unit. Located in the Barrie Primary Care Campus Building, a new facility that opened on November 21, 2016, the project enhances integration and collaboration between services and professionals to improve population health and health system sustainability. “The Healthy Barrie project is a positive example of how collaboration across the heath system, municipal government, and the university can help build a sustainable healthcare system,” said Professor Adalsteinn Brown, Director of the Institute of Health Policy, Management and Evaluation, who spoke at the kick-off with Barrie Mayor Jeff Lehman and the Honorable Dr. Eric Hoskins, Minister of Health and Long Term Care. At the event, Minister Hoskins explained how in the current system, primary care, home and community care, and population and public health services are planned and managed in distinctly different ways, independent of each other. He also emphasized the need to build a healthcare system that is more focused on the patient and the role that primary care can play in supporting that vision. 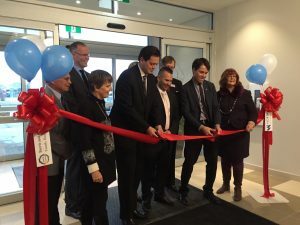 “The Healthy Barrie project is a shining example of how to better integrate the work of our primary care and public health partners to work towards a common goal,” said Minister Hoskins during his opening remarks. The partnership will also contribute to a stronger university presence in Barrie by linking the Dalla Lana School of Public Health’s strengths in health systems and clinical public health and the U of T Department of Family and Community Medicine’s strengths in community-based medical training with a coordinated health system and strong municipal leadership in Barrie. The goal is to put this community at the forefront of health research and education. “The Healthy Barrie project represents the next step in the evolution of health systems,” said Professor Ross Upshur, Heath of DLSPH’s Clinical Public Health Division who is working closely with Professor Brown on the project. “It will help to bridge the divide between clinical practice and population health by creating opportunities for the generation of new knowledge and training of health professionals,” said Upshur. Photo (from left to right): Dr. Brent Elsey, past Medical Director with the Barrie and Community Family Health Team (BCFHT); Dr. Anne DuVall, IT Clinical Lead with the BCFHT; Professor Adalsteinn Brown, IHPME; Mayor Jeff Lehman of Barrie; Anna Kazcor from Northwest Property Management; George Bitaxis from Northwest Property Management; Michael Feraday, Executive Director of the BCFHT; Dr. Eric Hoskins; and Ann Hoggarth, Liberal MPP for Barrie.